Celebrating 150 years of shared moments! Hold the Moment with the Proudly Canadian collector coin from the Royal Canadian Mint. The reverse is designed by Canadian artist Tony Bianco and features a coloured and engraved Canadian flag set against a backdrop of exploding fireworks. In the foreground, the dynamically flowing flag, viewed from slightly below, rises high into the sky above. It is engraved and painted in red and white. In the background, vast sprays of fireworks fill the sky. The fireworks are coloured in dazzling colours overlaid with glow-in-the-dark colouring that reveals even more excitement in the dark. The coin is engraved with the words "CANADA" and "FINE SILVER 9999 ARGENT PUR", the face value of "5 DOLLARS", and the commemorative dates "1867-2017". 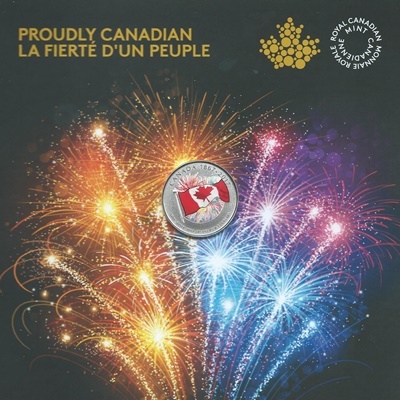 The coin comes packaged in a festively designed folder that showcases the coin against a background of bright fireworks with the title "PROUDLY CANADIAN".